It was such a pleasure to do this newborn session for my sweet friend! I got to watch her mommy’s belly grow over the last nine months. Baby Nora was so sweet and slept the entire time. I love working with new parents. It is such a sweet and exciting time as they venture into parenthood and I love to capture such special moments. 1. Please email ashleymushegan@gmail.com subject line: Holiday MIni Session-- list your desired dates and booking time. It would be helpful if you would list all of the different dates that will work for your family incase the first choice gets booked. 2. As soon as I confirm that your requested date is available then I will send you a PAYPAL link that MUST be paid within 48 hours to reserve your session. If the requested date(s) are booked then I will let you know so that you can choose another date. If you have not paid within 48 hours then I will need to open up the session time to the next in line. 3. I will confirm that you are all booked and the exact time within the next week. Thanks for following this process so that I can make sure I can reserve dates and times in the order that they are received. 1. Please email ashleymushegan@gmail.com subject line: Fall MIni Session-- list your desired dates and booking time. It would be helpful if you would list all of the different dates that will work for your family incase the first choice gets booked. Introducing Mr. and Mrs. Spicer...what a special day it was for this sweet couple! All of the details were perfect and the love between these two is amazing. It was such an enjoyable day getting to capture so many special moments for this family! I wish you guys the best as you start your new life together. Please enjoy this sneak peek of some of my favorite images of your wedding day! We were blessed BIG with this little sweet baby girl in October 2017! She has just turned 3 months old and it seems like just yesterday that we were headed to the hospital to meet our little one. It was such a special day for our family. Her two big sisters were so excited to meet their little sister. Beautiful baby girl! It was such a pleasure to photograph this sweet little family of 3 in their beautifully renovated 1930's home. Little Miss Eliza has mommy and daddy wrapped around her tiny little finger and Otis her big furry brother seems happy with the new addition. I always love working with new parents! There is just something about capturing a new mom and dad interacting with their little one that is just so sweet and pure. What a great session to start the new year! Looking forward to some more lifestyle sessions coming up this month. Message me if you are interested in booking an in home session for your family! 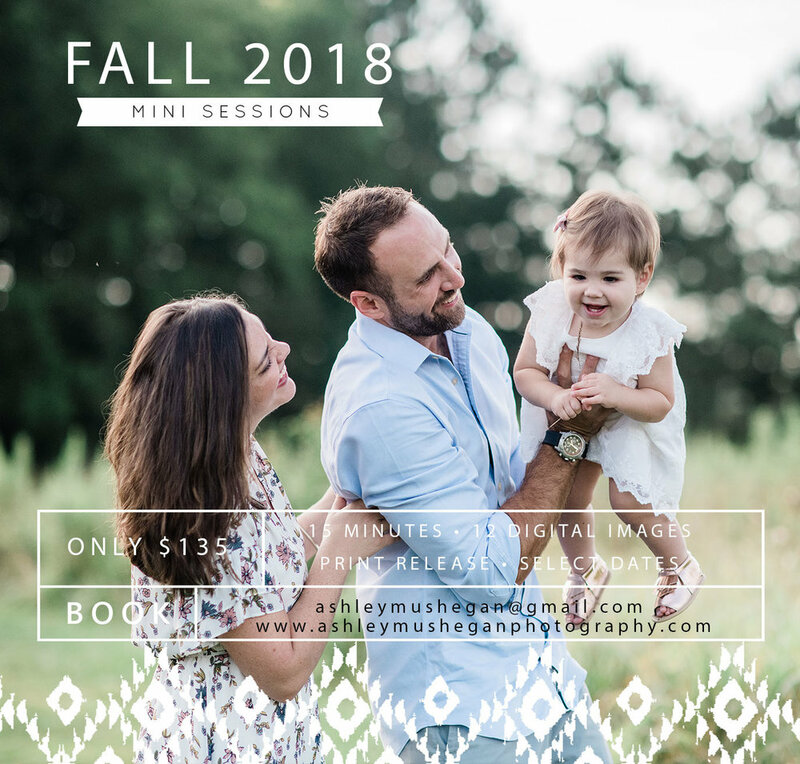 To reserve your mini session date and time please email ashleymushegan@gmail.com. I will send you a confirmation and a link to pay for your session online. Payment must be received within 2 days to reserve your session. I will send the location address and details the week of your session. Each mini session will last 20 minutes and you will receive at least 10 edited images of your session via digital download. I will be returning your completed sessions within 10 days so that you can use your images for Holiday Cards. HAPPY HOLIDAYS! Please READ all information before booking your session. The Cotton Field sessions will be very limited this year. I will only be a few weeks post c-section and will not be able to take on as many sessions as I usually would this time of year. 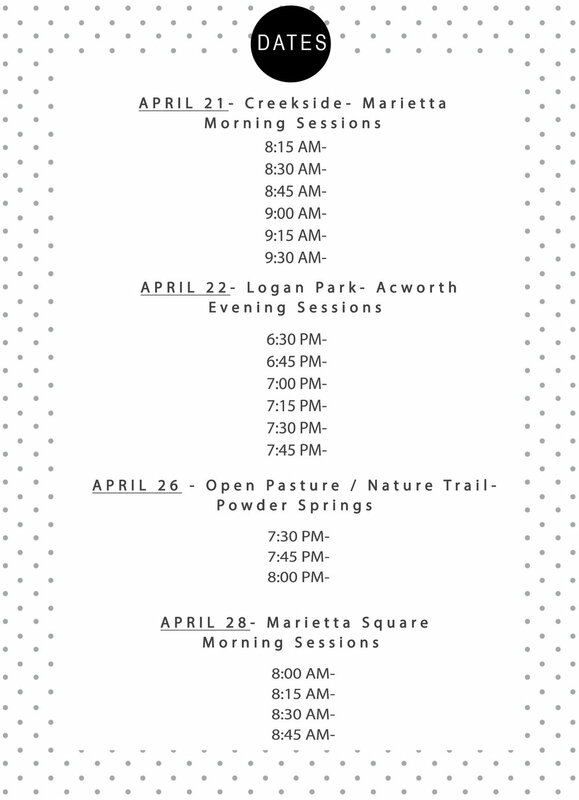 Since these fields are only in bloom every 2 years I wanted to be able to offer a few evenings of sessions. I have had many more people express interest in booking sessions then I have spots available so unfortunately these sessions will probably sell out quickly. 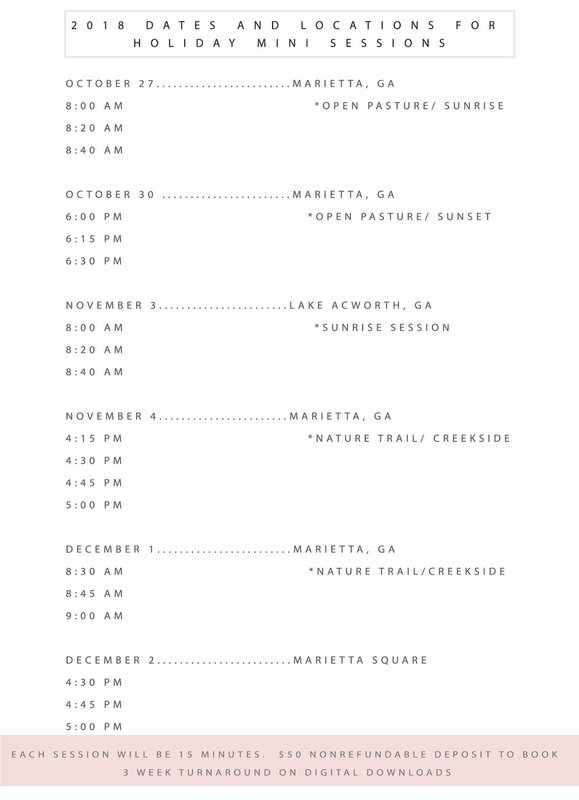 If you are unable to get a Cotton Field Session then I plan on offering a few additional FALL sessions in Mid November. 2. As soon as I confirm that your requested date is available then I will send you a PAYPAL link that MUST be paid within 24 hours to reserve your session. If the requested date(s) are booked then I will let you know so that you can choose another date. If you have not paid within 24 hours then I will need to open up the session time to the next in line. 3. I will confirm that you are all booked and the exact time within the next week. Thanks for following this process as I will be welcoming baby #3 into the world on Tuesday of this week. I must stick to this booking process so that I can make sure I can reserve dates and times in the order that they are received. I will be unable to respond to questions from October 10-13 but will get back with you soon after. Hopefully the above information answers your questions. *** There may be a few additional times in PAYPAL invoices are not paid. 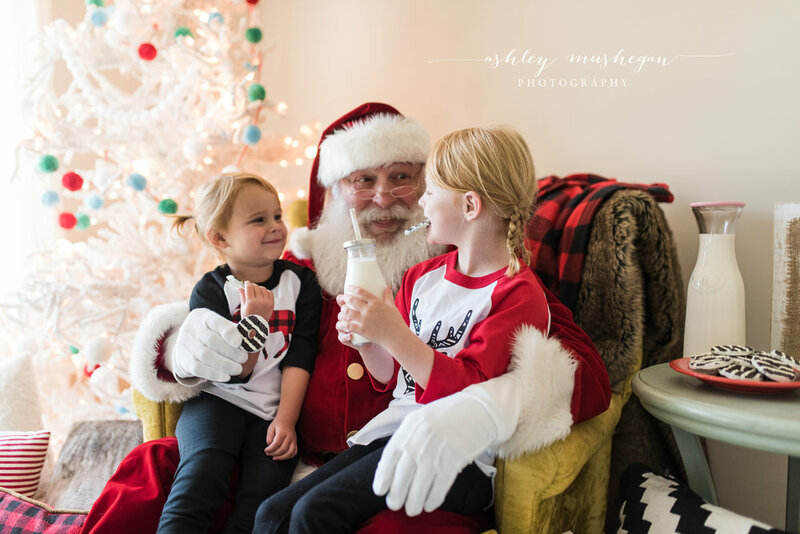 (Please read to the end of post for all important details & more images of Santa Minisessions) ***UPDATE as of 10/20 there are only 5 spots left...so if you plan on booking a session then do so ASAP. 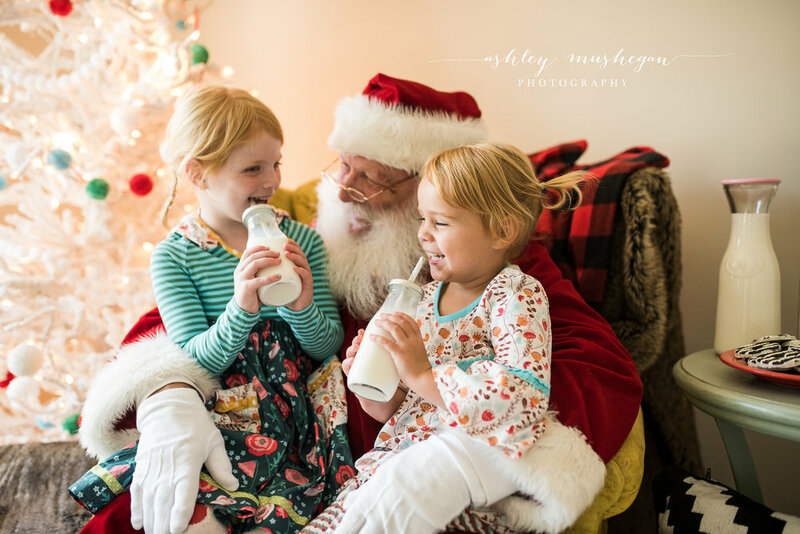 I am excited to offer Santa Minisessions this holiday season! Santa will be dropping by our studio for a couple of days in November. This is such a fun and magical season for your child and the perfect time to book a session to capture some of that magic. Your child will get to talk and share cookies with Santa and maybe even read a book! Skip the hustle and bustle of the mall Santa for a more personal and fun experience for your child. I am excited to be partnering with Jamie Thompson again who is a Trunk Keeper for Matilda Jane. She will be providing wardrobe from the latest collection of Matilda Jane Clothing. These sessions will give you the opportunity to dress your little lady in these adorable outfits. Also included in the package is a $30 Matilda Jane credit that you will get to use after the session with your very own trunk keeper...Mrs. Jamie Thompson TK#1073. All credit will be need to be used by December 30, 2016. She has amazing style and during the session she will provide racks of clothing from the latest MJ Fall release (sizes 3 months to 14 ) that you will choose from for your session. Check out www.Matildajaneclothing.com to see the most recent collection of clothes and if you see items that you just can't live without then use her Trunk Keeper #1073 to create a wishlist! The use of the Matilda Jane clothing is optional as you may have some other special attire picked out! If you have a little guy that you want to coordinate then you can dress him in neutral colors so that he is ready to coordinate! 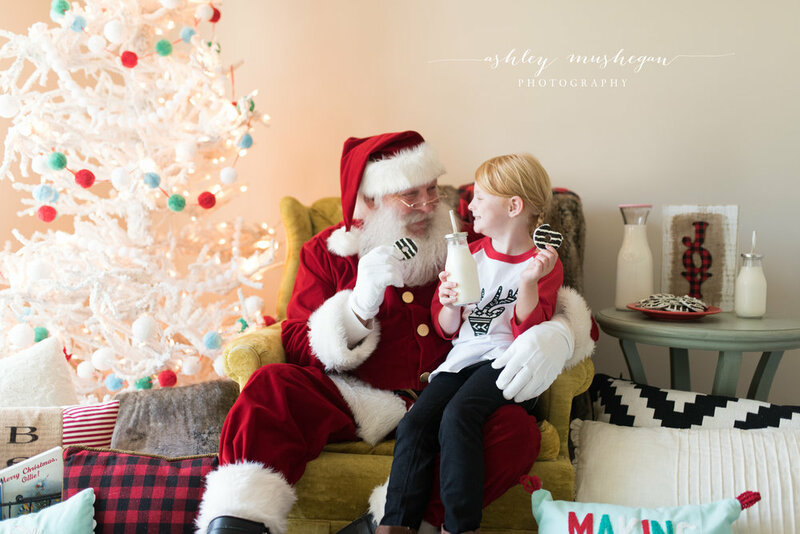 -------->>>>>>>To enter to win a free Santa Mini Session, join us on FACEBOOK. The session AD is at the top of the page. 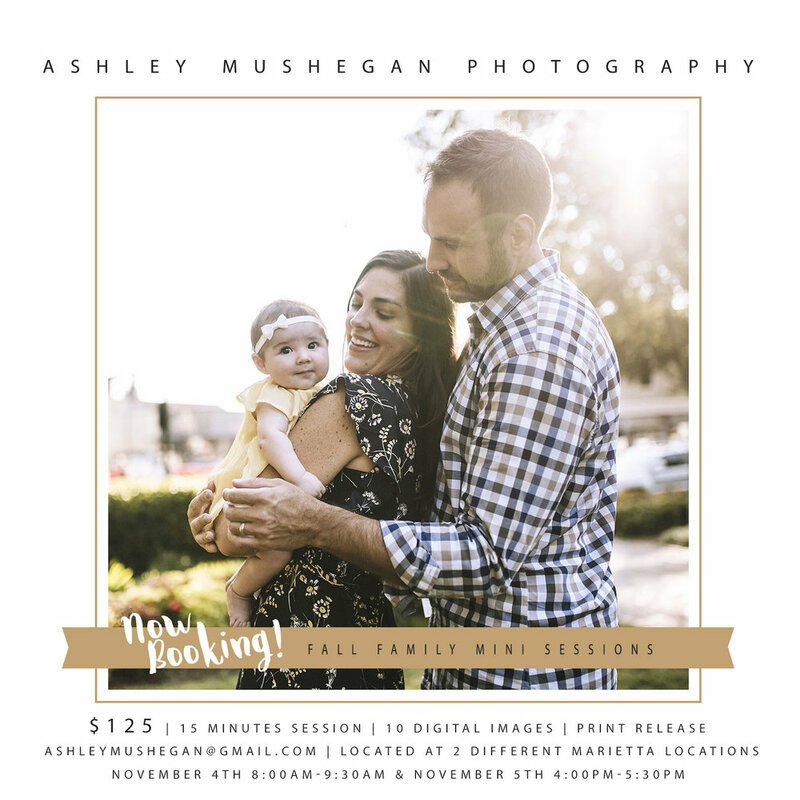 Please LIKE Ashley Mushegan Photography's Page, Like the session AD, and leave a comment with your name. That is all you need to do to enter. If you would like to share the FACEBOOK AD with your friends on your Facebook page then that would be awesome and your name will be entered twice. You must enter to win by November 1st at 11:59pm. The name drawing of all entries will take place on the following day and the winner will be posted to the comments section of the ad. *This contest is in no way affiliated with Facebook. Sessions are located in Dallas, Georgia. The $50 nonrefundable deposit will be applied to the session fee. Sessions will be booked on a first come, first serve basis. I will hold your session for 5 business days to allow time for the deposit payment. Balance will be due in full at the time of your session. Your 8 high resolution digital images will be available to download within 1 week of your session. You will also receive a print release that will allow you to print out images at the print lab of your choice. I will send print lab recommendations with your session. Remember to book early to get the time and date that you want. All Matilda Jane credit should be used on full price items with TK #1073 by December 30, 2016.